Just before I attended my meal for the Friday Food Club, I will do another write up about the experience in another post. I was in portobello road Makan is a little cafe near to Ladbroke Grove station. I also managed to try one of the curry chicken puff on this visit. The best thing to get is the authentic Malaysian tea called Teh Tarik, I was very fortune to watch them prepare a fresh batch. Amazing how they can pull tea in arm lengths without dripping anything. I have tried many attempts at home, and always seem to get tea poured onto my hand. 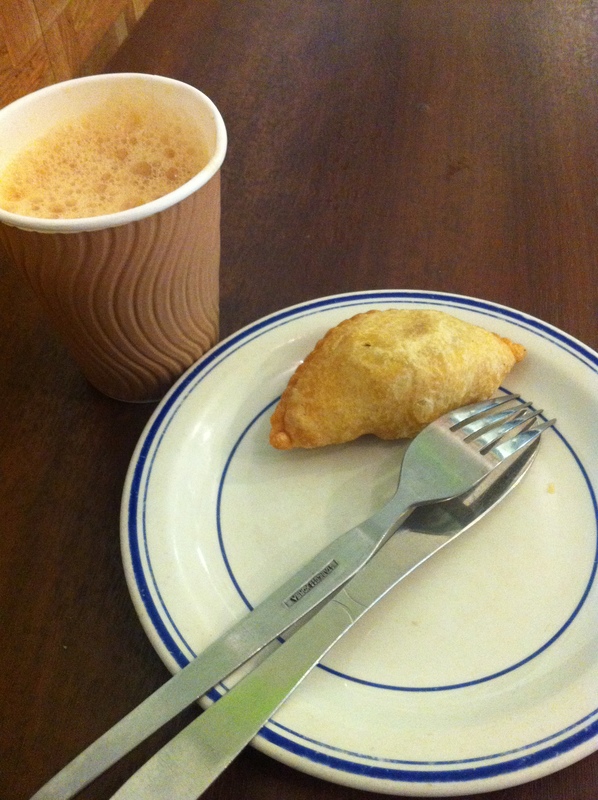 The curry chicken puff was a nice size and wasn’t too spicy bargain for 80p and the teh tarik was £1.50. 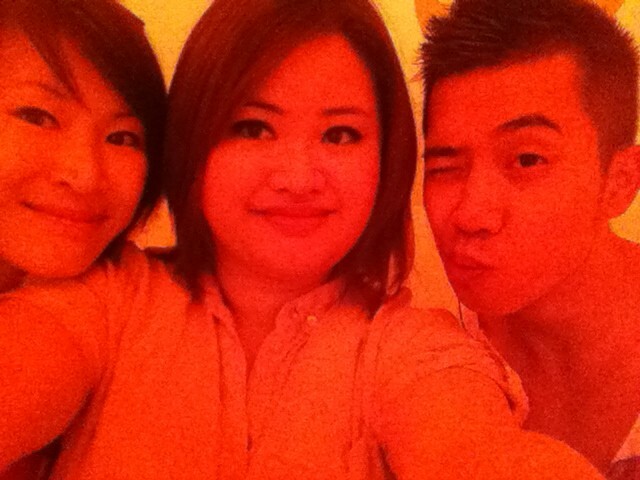 Saturday I was at Hi!sushi for my friends hen, coming on to Sunday my friends wanted to meet me up. We started off in Starbucks for some ice cold blended frapps slowing making our way to central London. Well it didn’t go according to plan I was meant to cook some Japanese Katsu curry for them, but they thought it was too much hassle. 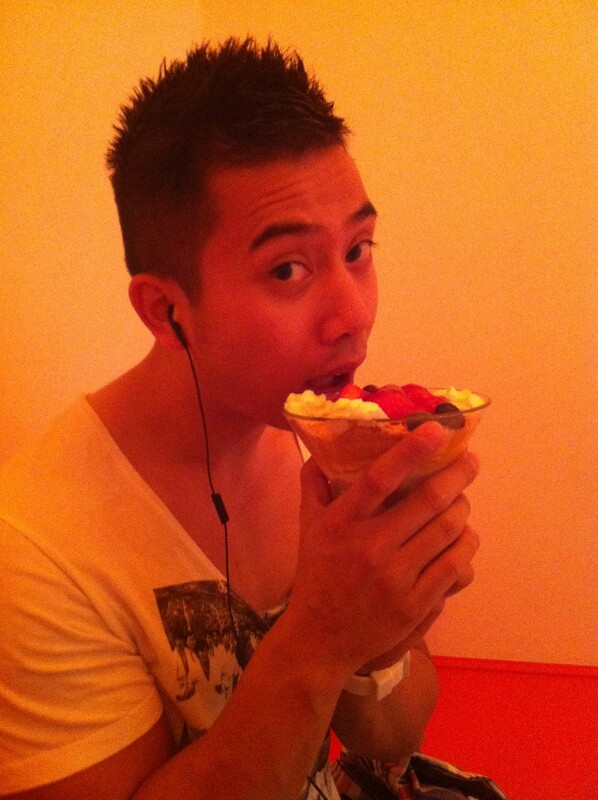 As they were feeling desserts, I suggested taking them to MADD. This was my second visit to MADD (check my old post here) and I happened to meet the brain child and company this time round. Ralph told us he was beginning to design and renovate a new concept for the store. Focusing on the MADD theme, they are installing a bath tub and bubbles blowing from the ceiling. The seating will be change to be more comfortable and the store will open longer and incorporating cocktails late in the evening. Sounds like an epic new renovation, huh? 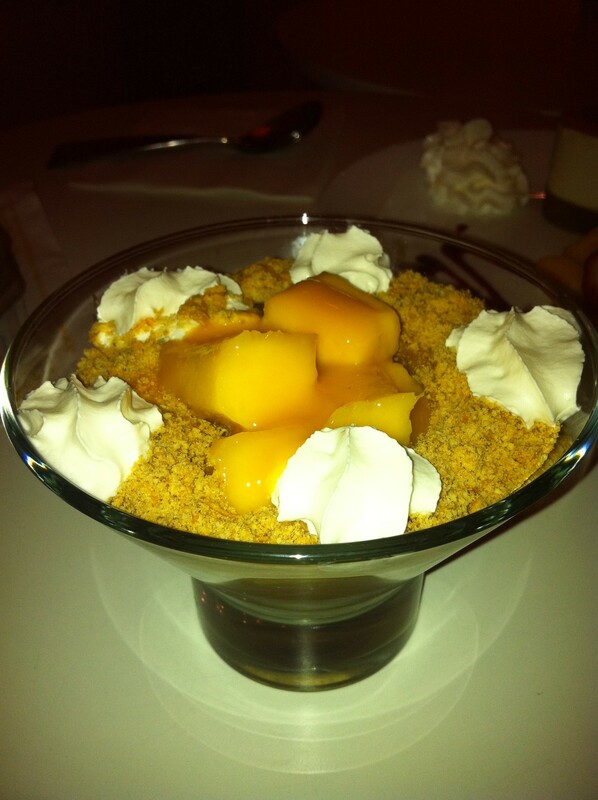 I had a mango crumble this time round, the crumble was very light and tasted like cornflakes it wasn’t the usual stuff in most desserts the mango puree sauce was nice and generous chunks of mangos was garnished on top along with cream. My friends enjoyed their desserts equally and we even managed to fit a round of Jenga as well, it’s a nice place to chill with a group of friends. After my friend Luong left us, van and I ended up back in docklands area, we didn’t want to go home just yet, starting to feel nibblish I suggested Fish and chips in Greenwich. As we arrived the area is a popular spot for tourist searching around the restaurants we decided to go back to the fish and chips place we tried before. My favourite choice of fish I always for is called plaice fish, the texture is a lot softer and moist then cod and is distinctive in flavour. 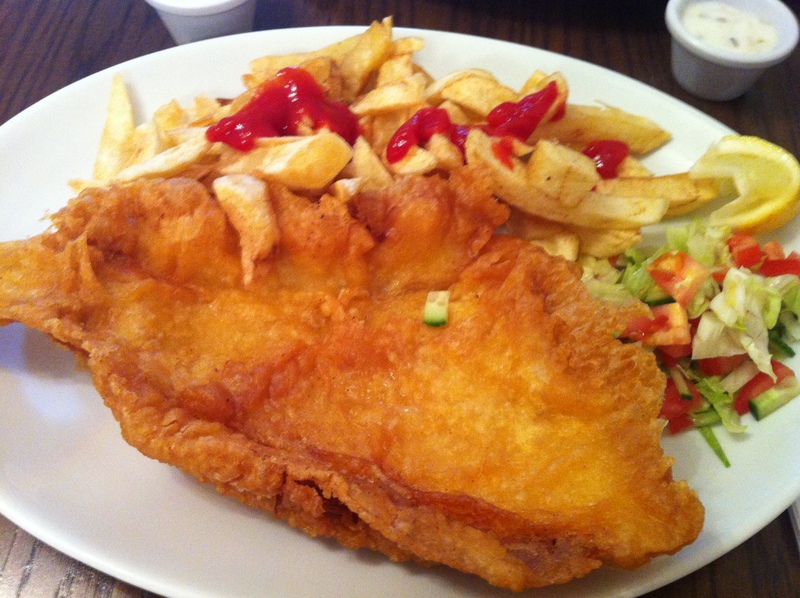 My portion was huge with plenty of chips and garnished with a side salad. We were very full from the meal. My fish and chips and sprite cost me £8. 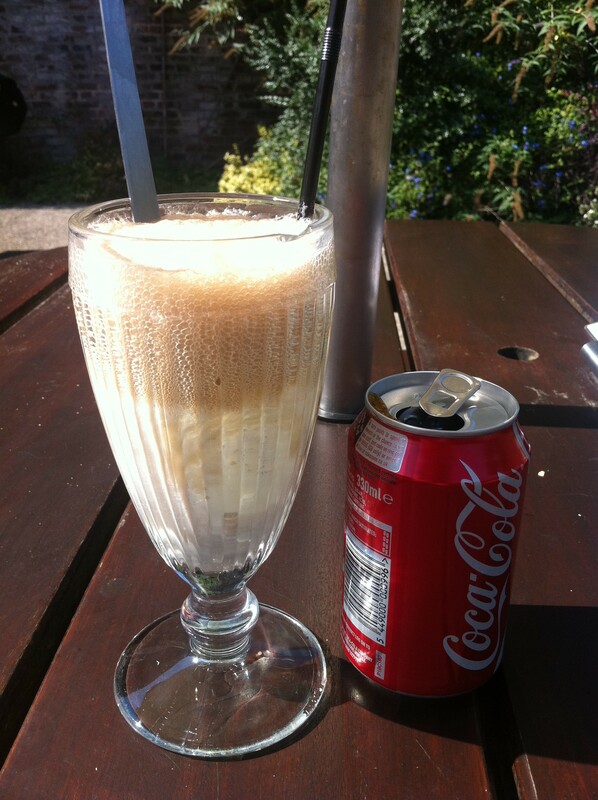 Monday, I happened to go sunbathing in Greenwich park before I entered, I notice a cafe nearby serving cola floats, they so hard to come by in London unless to go to an American diner, or the seaside. Tinseltown does them for a whopping £4.50! The cafe sold them for £2.80.